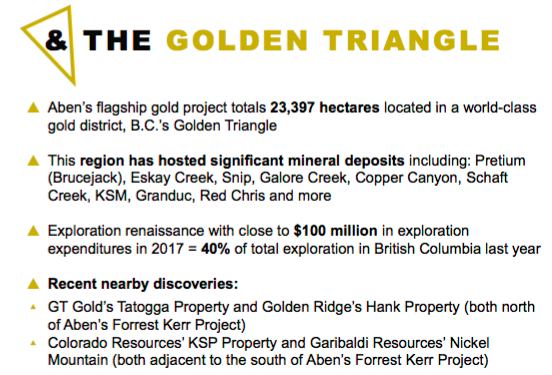 Peter Epstein of Epstein Research profiles recent moves by Aben Resources, which is exploring in British Columbia's Golden Triangle. The Golden Triangle (GT), in northwestern British Columbia (Canada) is a tremendous place to explore and make precious and base metal discoveries. It's known for monster high-grade gold deposits, but also hosts silver, copper and other base metals. When one considers the GT, one might think of Pretium Resources' new bonanza-grade gold (Au) mine. Pretium has an Enterprise Value of about C$2.6 billion. 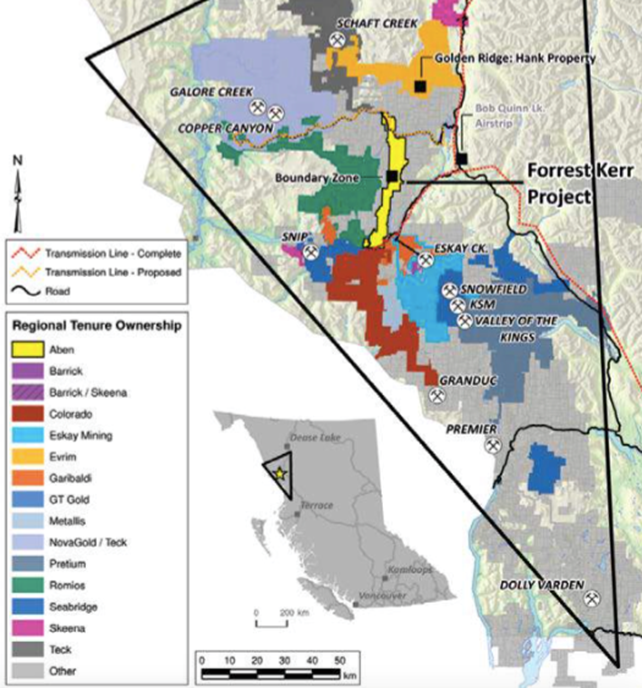 But, there are many prominent players in the GT, including Teck Resources, Barrick Gold, Goldcorp, Newmont Mining, Antofagasta, Hecla Mining, Hudbay, Centerra Gold, Hochschild, Seabridge Gold and SSR Mining. Past producing mines include Premier, Snip and Eskay Creek. Other well-known mines/development projects include Brucejack, Galore Creek, Copper Canyon, Schaft Creek, KSM, Granduc and Red Chris. Eskay Creek reportedly produced 3.27 million ounces of gold at 49 g/t Au and 158 million ounces of silver at 2,406 g/t. So yeah, this isn't just a top Canadian jurisdiction, it's a world-class destination. A very important factor in the GT's reemergence last year is that to a large extent, success for one player is success for all. For example, Pretium's (and others)development over the past decade led to very significant improvements in critical infrastructure. 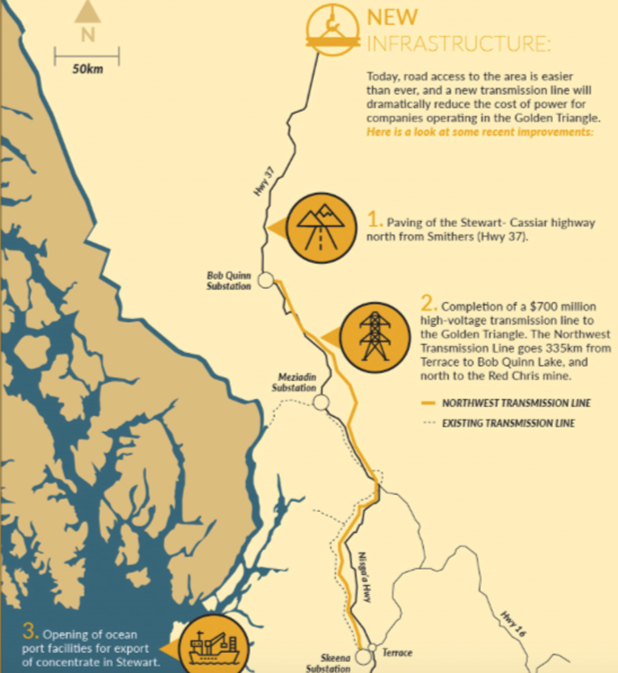 There's the paving of the Stewart-Cassiar highway (Highway 37) north from Smithers, the Northwest Transmission Line, a C$700 million, 344-km, 287-kilovolt power line was finished in 2014 and the completion of a three dam, 277 MW hydroelectric facility ~70km northwest of Stewart. Also near Stewart, year-round access to improved Stewart deep water ocean port facilities. Of course, wherever there's blockbuster discovery potential, one will find dozens of juniors hoping to cash in by controlling land reasonably close to the most exciting (existing and past producing) mines and development projects. The GT has its share of those juniors, many of whom are too small to fund the drill campaigns needed to maximize the chances of making noteworthy discoveries. Readers beware, the GT mints both kings and widows, far more of the latter. On the heels of Pretium's success in reaching production last year, and exciting new discoveries by companies including GT Gold Corp., Garibaldi Resources, Golden Ridge, Colorado Resources and Aben Resources, the GT is a hot place to be (for at least the third time in its history!). Of the new discovery companies mentioned above, I think that Aben Resources Ltd. (ABN:TSX.V; ABNAF:OTCQB) is particularly interesting. Its three discovery holes in the GT were drilled in 2017, but the company delivered a monster assay from the first hole of the 2018 season. It returned four separate high-grade zones within 190m downhole, including a thin 331 g/t gold over 1m within a broader interval of 38.7 g/t Au over 10m (from 114 to 124m), including 62.4 g/t Au over 6m. The other intervals included 22 g/t Au over 4m, 3.9 g/t Au over 13m and 8.2 g/t Au over 6m. 38.7 g/t Au over 10m, that's a grade x thickness (GT) of 387, one of the better assays announced in the entire Golden Triangle region this year or last. Importantly, Gwen Preston, the "The Resource Maven," put out a very informative and positive report on Aben Resources last week, causing trading volume and the share price to rise. This is a true vote of confidence from a woman with multiple successes, including her backing of Great Bear Resources—one of the best junior mining stories of 2018. Still, while the potential rewards are high, the risks are well above average because the region is extremely complex geologically. Complex means that, at the very least, considerable time and capital consuming exploration needs to be done. Adding to the complexity is that, due to its far northern location, most of the camps in the GT can only be explored for half of the year. Helicopters are often required to fly manpower and equipment in and out, so exploration costs are high.